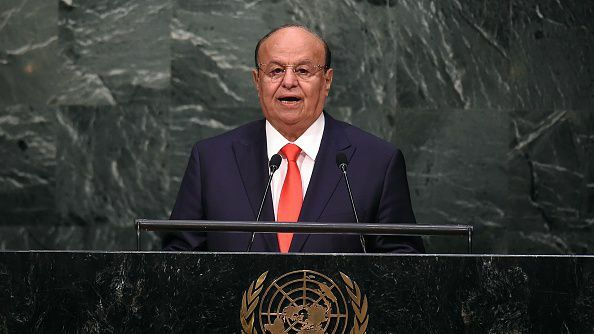 Yemen’s internationally recognized President Abedrabbo Mansour Hadi says he is open for military action to outdo Houthi rebels noting that negotiations with the rebels will always fail because of Iran’s influence. 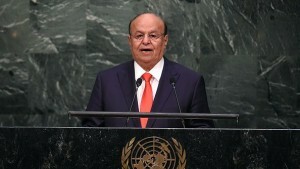 Hadi told Saudi Arabia media Al-Arabiya television broadcast on the sideline of UN General Assembly in an interview that “the military solution is the most likely solution arguing the decision does not rest with the rebels but with their supporter, Iran. “Even if you come to an agreement with them, they call up Iran … back out, and then you don’t have a deal,” Hadi said in the interview aired this week-end. Yemen descended into a conflict two years ago after Houthis, associated with former President Saleh, and with the support of Iran took control of capital Sanaa, forcing Hadi to flee briefly to Saudi Arabia before coming back to the country’s second city of Aden. The rebels came close to taking over the entire territory but were stopped by a Saudi-led coalition which backed up Hadi forces. UN-led negotiations to end the conflict which has killed over 10,000 people have failed. Yemen authorities have accused Iran of derailing the process. Iranians official sources this month noted that Saudi Arabia sought Teheran’s help in advancing peace talks. Hadi praised President Trump’s policy in the region; pressure on Iran and the Houthis. Yemeni leader chided Barack Obama whom he said was more concerned with achieving the historical 2015 nuclear deal with Iran. For me the deal instead expanded the Islamic Republic’s influence in the region. Written by: KanelkaTagba on September 25, 2017. Posted by KanelkaTagba on Sep 25 2017. Filed under Gulf News, Headlines. You can follow any responses to this entry through the RSS 2.0. Both comments and pings are currently closed.